This chapter provides an introduction to Canada’s Changing Climate Report (CCCR). The report’s purpose and scope of work are described, along with the approaches used to develop and deliver the content. Climate change is one of the defining challenges of the 21st century. It is a global problem, and tackling it requires global action. Governments around the world have committed to work together to limit global warming, recognizing that climate-related risks grow with the magnitude of warming and associated changes in climate. The Paris Agreement under the United Nations Framework Convention on Climate Change, which entered into force on November 4, 2016,1 established a goal of holding the increase in global temperature to 1.5°C–2°C above pre-industrial levels, as well as a commitment to engage in adaptation planning and implementation. Collective action in pursuit of the global temperature goal is being implemented; however, it is recognized that this goal will only reduce and not eliminate the risks and impacts of climate change. Governments and citizens need to understand how climate change might impact them, in order to plan and prepare for the challenges that climate change brings. Understanding climate change and its consequences draws from the physical, biological, and social sciences. Ongoing research in these fields is leading to an ever-growing body of published scientific literature related to climate change. Assessing this growing knowledge base, and communicating how understanding of climate change has grown, is challenging, especially as there is a wide audience for this information. The impacts of climate change are a concern for individuals, communities, business sectors, and governments, from local and regional to national and international scales. “Science assessments” provide a way to critically analyze and synthesize existing knowledge on a topic, including an evaluation of confidence in our understanding and of remaining uncertainties. In so doing, science assessments can serve as a source of robust information for answering the questions and concerns of a wide audience. Global-scale scientific assessments of climate change have been conducted by the Intergovernmental Panel on Climate Change (IPCC) (see Box 1.1) regularly since 1990 and have been pivotal in providing the global community with a knowledge base to inform decision-making. National-scale climate change science assessments speak more directly to national audiences. The Intergovernmental Panel on Climate Change (IPCC) is an international body responsible for assessing the science related to climate change. It was set up in 1988 by the World Meteorological Organization (WMO) and the United Nations Environment Programme (UNEP) to provide decision-makers with regular assessments of the scientific basis of climate change, its impacts and future risks, and options for adaptation and mitigation. The assessments are undertaken and presented in a way that is relevant to policy but not prescriptive of any specific policy. The IPCC is both scientific and governmental in nature. Participation in the IPCC is open to all member countries of the WMO and the United Nations. The Panel, made up of representatives of member states, makes major decisions at plenary sessions. The IPCC Bureau, elected by member governments, provides guidance to the Panel on the scientific and technical aspects of the Panel’s work and advises the Panel on management and strategic issues. IPCC assessments are written by scientists who volunteer their time and expertise as authors of these reports. IPCC reports undergo multiple rounds of drafting and are reviewed by both scientific experts and governments to ensure they are comprehensive and objective, and are produced in an open and transparent way. Over the past two decades, Canada has produced three broad, national climate change assessments (Maxwell et al., 19977; Lemmen et al., 20085; Warren and Lemmen, 201410), as well as sector- or region-specific assessments on human health (Séguin, 20089), transportation (Palko and Lemmen, 20178), and marine coasts (Lemmen et al., 20164). These reports communicated to Canadians the risks and opportunities climate change presents and focused on assessing our readiness to adapt to potential impacts. National climate change assessments help citizens and stakeholders become better informed and engage in discussions about how to respond to the challenges of climate change in Canada through both mitigation and adaptation (see Box 1.2). While all of these assessments included high-level overviews of observed and projected changes in Canada’s climate, only one report had a full chapter dedicated to changes in physical climate (Bush et al., 20141). The current National Assessment, Canada in a Changing Climate: Advancing our Knowledge for Action, was launched in 2017 (https://www.nrcan.gc.ca/environment/impacts-adaptation/19918). As part of this process, a more comprehensive assessment of changes in Canada’s climate has been carried out than in past assessments. The assessment as a whole will examine how Canada’s climate is changing, the impacts of these changes, and how we are adapting to reduce risk. A series of authoritative reports will be completed between 2018 and 2021 as part of the National Assessment process. Canada’s Changing Climate Report (CCCR) is the first major product of the current National Assessment, and it focuses on answering the questions: how has Canada’s climate changed to date, why, and what changes are projected for the future? A National Issues report will focus on climate change impacts and adaptation issues that are of national importance or that would benefit from an integrated, cross-Canada perspective. A Regional Perspectives report will provide a picture of climate change impacts and adaptation in six regions of Canada. Health of Canadians in a Changing Climate will provide an assessment of the risks of climate change to the health of Canadians and to the health care system. An Enhanced Synthesis will be produced in 2021. Mitigation, in the context of climate change, is defined as a human intervention to reduce the sources or enhance the sinks of greenhouse gases (IPCC, 20132), since greenhouse gases (GHGs) have climate warming effects. A source is any process, activity, or mechanism that releases GHGs to the atmosphere. Both natural processes and human activities release GHGs. A sink is any process, activity, or mechanism that removes GHGs from the atmosphere. In addition to GHGs, mitigation also applies to reducing emissions of other substances that have a warming effect on the climate. Adaptation is the process of adjustment to actual or expected climate and its effects. In human systems, adaptation seeks to moderate or avoid harm or exploit beneficial opportunities. In some natural systems, human intervention may facilitate adjustment to expected climate and its effects. Climate change is a global phenomenon, and Canada’s national climate change assessments build on a foundation provided by the global-scale science assessments of the IPCC, which have been produced every five to seven years since 1990. These assessments are widely recognized as the most authoritative reference documents on the state of knowledge on climate change, its potential consequences, and response options. Conclusions of successive IPCC assessments are considered to represent the most recent consensus of the international science community, based on publicly available knowledge up to that time. In this report, the most recent (Fifth) IPCC assessment (IPCC, 20132) is referred to heavily, especially in Chapters 2 and 3, which provide a synopsis of observed and future global-scale climate changes (see Section 1.4). A Sixth IPCC Assessment is currently underway, and a series of assessment reports will be released from October 2018 to spring 2022 (http://www.ipcc.ch/). A large volume of scientific papers have been published since the body of literature assessed in the IPCC Fifth Assessment. This report does not comprehensively assess this new literature, as doing so would duplicate the IPCC process. Rather, this report focuses on assessing new literature that advances understanding of climate change in Canada. document progress made on advancing adaptation action in Canada. The purpose of this report is to provide a climate science foundation for the other National Assessment products. Its objectives are to assess current knowledge about how Canada’s climate is changing and why, and what changes are projected for the future, to help inform mitigation and adaptation decision-making, and to help raise public awareness and understanding of Canada’s changing climate. The CCCR is therefore written for a broad range of professionals who are familiar with the topic of climate change but who may not have expertise in the physical sciences. The assessment process plans to engage intermediary (or amplifier) organizations to help raise awareness and understanding among the broader public of how Canada’s climate is changing. A climate science assessment, such as this report, is based on published scientific literature. It provides an overview and synthesis of that literature and an evaluation of the confidence in our understanding and of remaining uncertainties, based on the expert judgment of the authors. A climate science assessment can help inform decision-making but cannot provide detailed climate information to directly support local planning or decision-making — this is the role of climate services. Regional climate services in Canada have been available for more than a decade through institutions such as Ouranos and the Pacific Climate Impacts Consortium and are now being established at a national scale. Persons engaged in climate impact assessments or adaptation planning can make use of this assessment to provide an authoritative overview of climate science relevant to climate change in Canada but will need to identify sources of information that are best suited to their particular application. The Canadian Centre for Climate Services (CCCS) Library of Climate Resources is a collection of links to climate datasets, tools, guidance, and other related resources. The Climate Services Support Desk will assist Canadians in finding, understanding, and using climate data, information, and tools in their planning and adaptation decision-making. The scope of the CCCR is limited to physical climate science and is aligned with the scope of assessments of the physical science basis of global-scale climate change by the IPCC’s Working Group I. IPCC Working Group I reports (e.g., IPCC, 20132) cover climate drivers, observed changes in the global climate system and their causes, and projection of future global-scale changes. The scope of the CCCR is similar but focuses on observed and projected changes in climate for Canada’s land area and surrounding oceans. Changes in freshwater availability, a topic considered by IPCC Working Group II (Impacts, Adaptation and Vulnerability) (IPCC, 20143), is included in the CCCR to maintain a close link to the underlying evidence base in terms of changes in physical drivers. While the aim is to provide an assessment of changes for Canada as a whole, information on regional-scale changes is also included, where possible. Some dedicated regional climate analyses were undertaken in support of the National Assessment, using political boundaries to define the regions, consistent with regional definitions of previous national assessments (see Figure 1.1). These results are provided in Chapter 4. For some topics — such as changes in oceans surrounding Canada; changes in glaciers, sea ice, and permafrost; and changes in freshwater availability — regional perspectives are provided based on natural boundaries of the systems of concern. These results are in relevant chapters of this report (see Section 1.4). To note, in some places in this report, a geographical boundary for assessment of changes in northern Canada is used, defined as the region north of 60° latitude and rather than by political boundaries, as in Figure 1.1. Therefore, where “the North” is used, this refers to the three territories; where “northern Canada” is used, this refers to the region north of 60° latitude. Assessment of biogeochemical cycles, including carbon-cycle changes, and related information on Canadian sources and sinks of greenhouse gases, is beyond the scope of this report. Information on nationally reported anthropogenic emissions for Canada is available through Canada’s national GHG inventory (https://www.canada.ca/en/environment-climate-change/services/climate-change/greenhouse-gas-emissions/inventory.html). Information on the state of the North American carbon cycle can be found in the Second State of the Carbon Cycle Report, currently in development with a planned publication date in the fall of 2018 (https://www.carboncyclescience.us/state-carbon-cycle-report-soccr). The CCCR draws primarily from existing sources of information that have been peer-reviewed and are publicly available. Exceptions include updates to published results, which were deemed acceptable as long as the method used to update data was citable. In addition, projections of future climate change for Canada, for some variables, are directly available as output from climate models. In this case, the projections specific to Canada have not always been published, although the models used to produce these projections have been comprehensively evaluated and documented in the peer-reviewed literature. Where relevant, quantitative information that has not been through external peer review was considered for inclusion; authors were required to judge the quality and reliability of the information and to maintain a copy of it. All chapters of this report underwent external peer review (see Section 1.3.2). It is recognized that Indigenous observations and knowledge systems contribute significantly to our understanding of changing climate. This knowledge is incorporated in other reports of this assessment, where the holistic perspective of Indigenous knowledge systems contributes to a fuller understanding of climate change impacts and of the ability of human and natural systems to adapt. Environment and Climate Change Canada, as the focal point for climate science expertise in the federal government, led the development of the CCCR. Authors with recognized expertise were invited to lead individual chapters of the CCCR. The lead author team, assessment coordinators, and representative stakeholders came together for an initial scoping meeting in February 2017 to discuss the overall aims and scope of the CCCR and to develop initial chapter outlines. Lead authors then formed chapter author teams with the required expertise to comprehensively assess chapter topics. Discussions at the scoping meeting with a panel of stakeholders provided key input to developing the CCCR to be effective and relevant. External review of the report included both a targeted review by invited reviewers with specific subject-matter expertise and an open review involving other experts who registered through the National Assessment portal (https://www.nrcan.gc.ca/environment/impacts-adaptation/19924). In addition, members of the National Assessment Advisory Committee, National Adaptation Platform, and the Atmosphere-Related Research in Canadian Universities (ARRCU) working group were invited to participate in the external review. Each chapter of the CCCR begins with a set of key messages: those findings the authors felt are most relevant to the target audiences. The key messages include quantitative information about how various components of the climate system — such as the atmosphere and cryosphere — have changed over specified periods of time and projections of additional change this century. These quantitative results emerge from the body of evidence assessed within each chapter of the CCCR. As a science assessment involves critically analyzing the knowledge base and deciding on the level of confidence in results (see Section 1.1), conveying the degree of certainty and uncertainty about results is important. In the CCCR, authors have done this for key messages by adopting the calibrated uncertainty language of the IPCC (Mastrandea et al., 20106). This allows authors and audiences to distinguish between what is well known and widely accepted and what is not well known or not agreed upon. Confidence in the validity of a result based on the type, amount, quality, and consistency of evidence (e.g., mechanistic understanding, theory, data, models, and expert judgment) and the degree of agreement. Confidence is expressed qualitatively. Likelihood of a result occurring based on quantified measures of uncertainty expressed probabilistically (based on statistical analysis of observations or model results, or expert judgment). Likelihood is expressed quantitatively. When a quantified measure of uncertainty (i.e., likelihood) is provided but no confidence level is given, a high or very high confidence level is implied. Calibrated uncertainty language is italicized where used in the CCCR (e.g., likely or very likely), and definitions are provided in Figure 1.2 and at the first use of one of these terms in each chapter. Confidence statements are used more frequently in this report than are likelihood statements because the requirements for an assessment of likelihood – quantified estimates of uncertainty – were not available in the supporting literature in many cases. The application of calibrated uncertainty language is an important feature of the scientific assessments undertaken by the IPCC, and the same approach is adopted here. 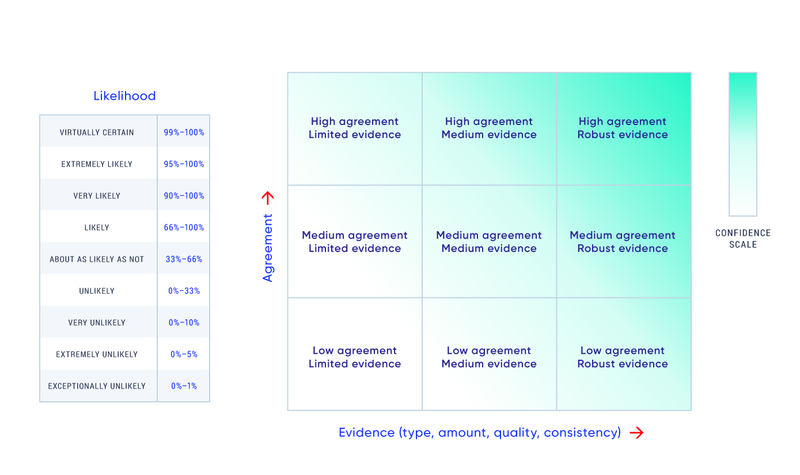 In essence, the author teams identify relevant scientific literature, data, or model outputs; evaluate the amount of evidence and the level of agreement (or disagreement); and then apply their collective expert judgment to make an assessment of confidence, or where possible, likelihood. The wording of each key message is a collective effort of the chapter author team, aimed at providing clear and concise messages that are underpinned by the literature cited in the body of the chapters. Summary statements are included in each chapter to provide a traceable account of the authors’ assessment of the supporting evidence for key messages. This report assesses observed and projected changes in climate for Canada. Therefore, it refers to both past and future time periods. Past changes are assessed over periods of time for which there are sufficient data records, either based on direct measurements (observations) and/or satellite data. This means that observed changes are described almost exclusively for time periods beginning sometime in the 20th century. The CCCR does not assess changes in current climate relative to conditions that existed in the distant past (paleoclimate) but does provide information on levels of greenhouse gases in the atmosphere going back to the mid-18th century using values directly measured from ice cores (see Chapter 2, Section 2.3). To assess past changes in the climate, sufficiently long climate data records are needed for a detectable change to emerge from the natural fluctuations in the climate system. In general, estimates of change have smaller uncertainty with longer records. In the CCCR, different time periods for describing observed changes in climate are reported, reflecting the length of the available data record as well as the time when the work was completed. Some of these records extend back to the early 20th century, many begin after the mid-20th century, and satellite-based records start in the late 1970s at the earliest. There are also no standard time periods for assessing and discussing future changes in climate. Time periods of interest depend on the needs and concerns of the user of the information; for some, near-term changes and impacts are of most concern, whereas, for others, their interest demands a longer-term view. In the CCCR, assessment of future climate changes is based primarily on results from coordinated experiments to model global climate (see Chapter 3, Box 3.1). These experiments have designated time periods describing near-term, mid-21st century, and late 21st century conditions. The near-term time period has, naturally, shifted forward in time while the mid-21st century (2046–2065) and late 21st century (2081–2100) time periods remained the same. In the CCCR, we consider 2031–2050, about 10–30 years from now, as the near-term period. Where changes in climate are discussed relative to the end-of-the-century, this should be understood to mean by the year 2100. The near-term and late-century time periods are used in Chapter 4 to provide projections of future changes for Canada for various indicators and indices related to temperature and precipitation. Elsewhere in the report, results from the fifth phase of the Coupled Model Intercomparison Project (CMIP5, see Chapter 3, Box 3.1) may be discussed with respect to the CMIP5 defined near-term time period (2016–2035). Climate models project future changes relative to a reference period. In the CMIP5 experiments, the reference period was 1986–2005, which was representative of “current climate” at the time the experimental set-up was established. The core content of the CCCR is contained within Chapters 2 to 7. Chapters 2 and 3 focus on global-scale climate changes, and Chapters 4 to 7 focus on changes in climate across Canada. The global context presented in Chapters 2 and 3 is useful for understanding changes in Canada, recognizing the interconnectedness between changes occurring within a country or region and those occurring throughout the world. Chapter 2 provides a historical perspective on global-scale changes, summarizing observations of change throughout the Earth’s climate system and current understanding of the causes of these observed changes. Chapter 3 looks at future global-scale changes, describing the Earth system models used to project future climate change as well as the various emission scenarios — alternative plausible futures — used to drive these models. In addition to background on the methods of projecting future climate change, a synopsis of future changes at the global scale is presented, focusing on changes in temperature and precipitation, along with a discussion of how future global temperature change is related to the total amount of human emissions of carbon dioxide over time. Chapters 4 to 7 each cover observed changes, understanding of causes of change (specifically, the contributions of human influences and natural climate variability), and future changes, for different components of the climate system in Canada. Chapter 4 assesses past and future changes in temperature and precipitation for Canada, including changes in temperature and precipitation extremes, and presents analyses of some recent individual extreme events and their causes. Chapter 5 covers the cryosphere — those parts of Canada with frozen water, including snow, sea ice, land ice (glaciers and ice caps), freshwater ice (lake and river ice), and permafrost. Chapter 6 assesses past and future climate-related changes to Canada’s freshwater availability through key components of the water cycle, including streamflow, surface water levels (lakes and wetlands), soil moisture, drought, and groundwater. Chapter 7 looks at changes occurring in the three oceans surrounding Canada, including physical and chemical changes. 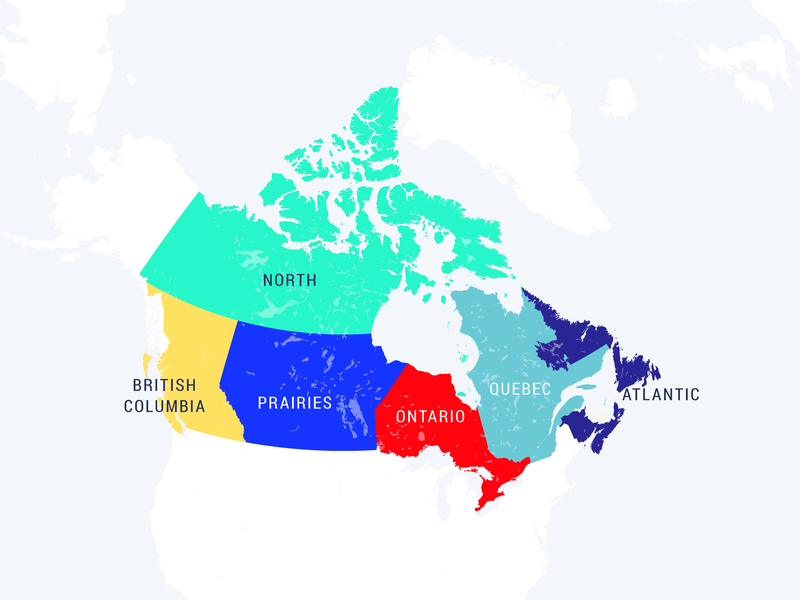 The final chapter of this report (Chapter 8) provides a short synopsis of changes for Canada as a whole and then a synthesis of changes assessed in Chapters 4 to 7 for northern Canada and for the five regions of southern Canada. This chapter may be useful for readers who prefer an overview of changes by geographical region before reading in-depth about changes in different components of the climate system in the core chapters. This chapter also helps transition to subsequent reports being prepared as part of the National Assessment (see Section 1.1).